Driving in ice and snow can be very hazardous. Each year, thousands of insurance claims are filed for drivers who have skidded into other cars or stationary objects while driving in icy conditions. 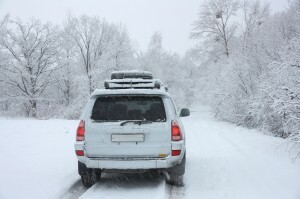 Here are a few tips to help you navigate the roads safely when winter weather comes to town. 1) Don’t go out. It seems simple enough to say, but many people do not realize just how important it is to stay in when the roads are hazardous. If you simply have to get to the store for that quart of milk, you might want to think about better planning—lay in supplies of food and do your errands in batches while the weather is good. If you are going to be driving no matter what, get snow tires. Check your state’s laws about studded tires or chains; some states do not allow them between certain periods. Have your snow tires put on early in the season; make sure they are well-maintained and checked periodically. 2) Decrease your speed. Most accidents on icy roads can be contributed to driving too fast for conditions. This does not mean the posted speed limit; it means driving at a speed which allows you time to correct for possible hazards. You will need at least three times the stopping distance on ice as on dry pavement, so slow down and give yourself plenty of time to negotiate corners and intersections. When you are driving in ice, you should also brake gently. You should not ever slam on brakes while on ice; this is a recipe for disaster. Instead, slowly brake in increments, giving yourself time to stop safely. Stop well before a stop sign or traffic light; better to be a few feet back than in the middle of an intersection. 3) Use your lights. Even in broad daylight, your lights will help you stay visible to other motorists. Use your windshield wipers to keep your screen free of snow and debris. De-ice your windshield before you begin driving by starting the car, letting it run for a few minutes, and scraping the ice from your windshield. You should also use lower gears. Many cars and trucks come equipped with four-wheel drive. This has actually increased the problem with driving in snow, because many four-wheel drive owners mistakenly believe they can navigate roads with four wheels they would not tackle with two. Instead of relying on four-wheel drive, engage your low gear to keep traction. 4) Be careful on bridges. Bridges often form icy patches well before the regular roadbed, so use extreme caution when crossing them, even if the temperature is above freezing. 5) Know how to handle a skid. If you begin to skid, take your foot off the accelerator, and steer “into” the skid. What this means is that you turn your front wheels in the direction you want to go, opposite what the rear wheels are doing. If you have front-wheel drive, do not steer but put the vehicle in neutral while you regain traction. 6) Keep sand or litter in your trunk. Not only will this help weight your vehicle down, giving you more traction, but it is very useful if you get stuck. Do not spin your wheels if you are stuck—this only makes the problem worse. Instead, “rock” the vehicle gently by shifting from forward to reverse and back again. Besides sand, you should also keep an emergency kit in your car. Road flares and a jack can be lifesavers in dangerous conditions. If you are stranded, do not leave your car unless help is within sight. Instead, turn on your flashers, put out flares if needed, and call for help. Keep blankets and hard candy, as well as water, in your car at all times in case you are stuck for some time. « If You Hit an Uninsured Motorist, Do You Still Have to Pay?